A fluorescence in situ hybridization (FISH) method was developed to visually detect viral genomic RNA using fluorescence microscopy. A probe is made with specificity to the viral RNA that can then be identified using a combination of hybridization and immunofluorescence techniques. This technique offers the advantage of identifying the localization of the viral RNA or DNA at steady-state, providing information on the control of intracellular virus trafficking events. Vyboh, K., Ajamian, L., Mouland, A. J. Detection of Viral RNA by Fluorescence in situ Hybridization (FISH). J. Vis. Exp. (63), e4002, doi:10.3791/4002 (2012). Viruses that infect cells elicit specific changes to normal cell functions which serve to divert energy and resources for viral replication. Many aspects of host cell function are commandeered by viruses, usually by the expression of viral gene products that recruit host cell proteins and machineries. Moreover, viruses engineer specific membrane organelles or tag on to mobile vesicles and motor proteins to target regions of the cell (during de novo infection, viruses co-opt molecular motor proteins to target the nucleus; later, during virus assembly, they will hijack cellular machineries that will help in the assembly of viruses). Less is understood on how viruses, in particular those with RNA genomes, coordinate the intracellular trafficking of both protein and RNA components and how they achieve assembly of infectious particles at specific loci in the cell. The study of RNA localization began in earlier work. Developing lower eukaryotic embryos and neuronal cells provided important biological information, and also underscored the importance of RNA localization in the programming of gene expression cascades. The study in other organisms and cell systems has yielded similar important information. Viruses are obligate parasites and must utilise their host cells to replicate. Thus, it is critical to understand how RNA viruses direct their RNA genomes from the nucleus, through the nuclear pore, through the cytoplasm and on to one of its final destinations, into progeny virus particles 1. FISH serves as a useful tool to identify changes in steady-state localization of viral RNA. When combined with immunofluorescence (IF) analysis 22, FISH/IF co-analyses will provide information on the co-localization of proteins with the viral RNA3. This analysis therefore provides a good starting point to test for RNA-protein interactions by other biochemical or biophysical tests 4,5, since co-localization by itself is not enough evidence to be certain of an interaction. In studying viral RNA localization using a method like this, abundant information has been gained on both viral and cellular RNA trafficking events 6. For instance, HIV-1 produces RNA in the nucleus of infected cells but the RNA is only translated in the cytoplasm. When one key viral protein is missing (Rev) 7, FISH of the viral RNA has revealed that the block to viral replication is due to the retention of the HIV-1 genomic RNA in the nucleus 8. Here, we present the method for visual analysis of viral genomic RNA in situ. The method makes use of a labelled RNA probe. This probe is designed to be complementary to the viral genomic RNA. During the in vitro synthesis of the antisense RNA probe, the ribonucleotide that is modified with digoxigenin (DIG) is included in an in vitro transcription reaction. Once the probe has hybridized to the target mRNA in cells, subsequent antibody labelling steps (Figure 1) will reveal the localization of the mRNA as well as proteins of interest when performing FISH/IF. Digest 1 μg of the in vitro transcription vector, pKS(+)pol 236nt 9 with Kpn1 enzyme at 37 °C for 1 hour and run the linearized DNA product on an agarose gel. The fragment should be approximately 2500 bp. Cut the fragment out of the gel and purify using the Roche Micro Elute Gel Extraction Kit (all reagents used are listed in Table 1). Perform the final elution in 30 μl elution buffer. Run 5 μl of the product on an agarose gel to verify the purification. Mix an in vitro transcription reaction (see recipe below) using the Roche DIG RNA labeling kit and incubate at 37 °C for 2 hours. Add 228 U of DNase I and incubate at 37 °C for 15 min. Stop the reaction by adding EDTA pH 8.0 to a final concentration of 20 mM. Purify the reaction by using the Quick Spin Columns from Roche as specified by the manufacturer. Purify the probe by precipitation with 1/10 volume DEPC-treated 3M NaOAc pH 5.2 and 2.5 volumes of ice-cold 95% ethanol. Mix and incubate at -80 °C for 30 min to overnight. Centrifuge the probe for 15 min at 4 °C at 15,000 x g.
Remove the supernatant and wash the pellet in ice-cold 70% ethanol. Centrifuge again for 5 min at 4 °C at 15,000 x g.
Remove the supernatant and dry the pellet. Resuspend the pellet in 50 μl water (DNase/RNase free) containing 10 U Invitrogen RNase OUT. Estimate the concentration of probe by spectrophotometry (measure RNA at 260 nm), and dilute to a concentration of 5 ng/μl. Store in aliquots at -20 °C for short-term use, or -80 °C for long-term storage. It is recommended to perform inter assay comparisons so conserve an aliquot for this. It is initially important to seed adherent cells onto untreated, sterile glass coverslips so the final confluency upon harvesting is approximately 70-80%. For non-adherent cells, grow as normal and when ready to collect, incubate them with coverslips that have been treated with 0.01% w/v poly-L-lysine (Sigma-Aldrich, Inc.) for 1 hour. For a typical 12-well polystyrene tissue culture plate (3.8 cm2), 150,000 cells (e.g. HeLa) are plated at 24 hours prior to transfection. Non-adherent cells can be infected or transfected as usual and allowed to adhere to glass cover slips before fixation 3. Discard the media and wash the cells with 1X phosphate-buffered saline prepared in double distilled water (DPBS) for 1 min. Diethylpyrocarbonate (DEPC, Sigma-Aldrich, Inc.)-treated 1X PBS may also be used, however untreated PBS cannot as it may contain RNase enzymes. Discard the PBS and add 4% paraformaldehyde, enough to cover the cells completely. Incubate for 15-20 min. Discard the paraformaldeyhyde and wash cells with 1X DPBS for 1 min. Discard the DPBS and add 0.1 M glycine (dissolved in 1X DPBS). Incubate for 10 min. Discard the glycine and wash the cells with 1X DPBS for 1 min. 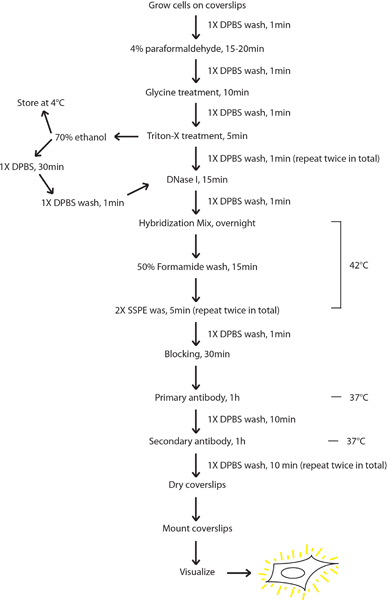 Discard the DPBS and add 0.2% Triton-X (dissolved in 1X DPBS). Incubate for 5-10 min. If staining for nucleolar or nuclear envelope proteins, permeabilize with Triton X-100 for no more than 5 min or the protein localization will become diffuse. Discard Triton X-100 and wash once in 1X DPBS for 1 min. For long-term storage, replace PBS with 70% ethanol and store at 4 °C for up to four months. Alternatively, wash once more with 1X DPBS and proceed to FISH. If the coverslips were stored in ethanol, replace the ethanol with 1X DPBS and allow the cells to rehydrate for 30 min. Rehydration can be done overnight if the coverslips are stored at 4 °C. Wash the coverslips with 1X DPBS for 1 min. Prepare slides to incubate the coverslips on, taking care to clean and label them well. For an 18mm coverslip, add 50 μl of DNase solution (25 units/coverslip, commercially available) to the slide. Add the coverslip, being sure to place it cell side down, and incubate it for 15 min at room temperature. Add 50 μl hybridization mix (see recipe below) per coverslip onto a slide and incubate the coverslip cell side down for 16-18 h at 42 °C. The incubation should be performed in a tray containing a 50% formamide, 2X SSPE mix (12.5 ml deionized formamide, 2.5 ml 20X SSPE, 10 ml water). Incubate coverslips cell side down in 50 μl 50% formamide (diluted in 1X DPBS) for 15 min at 42 °C. Wash the coverslips twice in 2X SSPE by incubating them cell side down in 50 μl 2X SSPE (20X SSPE diluted in 1X DPBS) for 5 min each at 42 °C. Wash the coverslips in 1X DPBS for 1 min. Block the coverslips by placing them cell side down in 50 μl 1X Roche blocking solution (10X Roche blocking solution diluted in 1X DPBS) for 30 min. Incubate the coverslips cell side down in 50 μl primary antibody solution for 1 hour at 37 °C. Anti-DIG antibody should be diluted according to manufacturer's direction in 1X blocking solution. If other antibodies are being used to stain proteins, they may be added at the correct concentration provided that all antibodies used are derived from different host species. Wash the coverslips for 10 min in 1X DPBS. Incubate the coverslips cell side down in 50 μl secondary antibody solution for 1 hour at 37 °C. Alexa Fluor-conjugated antibodies (Invitrogen) can be used to generate a range of colors and are used at 1:500 in 1X blocking solution, 1X DPBS. Wash the coverslips twice for 10 min each in 1X DPBS. Dry the coverslips cell side up on Whatman paper. Be sure to cover the coverslips to avoid exposure to light and bleaching. Once all liquid is evaporated, mount the coverslips onto fresh slides using 8 μl ImmunoMount (Thermo Scientific, Inc.). Gently tap down the coverslip to eliminate any air bubbles. Apply nail polish to the edges of the coverslip to secure it in place. The visualization of RNA and proteins by microscopy techniques is also critical to the success of this technique. Settings on the microscope used can help or hinder visualization so it is key that the settings on the microscope be set correctly and be consistent from one sample to another in a given experiment. For detailed microscopy settings, optics and antibody combinations please see references1,10. An example of viral RNA staining can be seen in Figure 2. The viral RNA for HIV-1 is seen throughout the cytoplasm displayed diffusely for the most part, although small cytoplasmic punctae are not uncommon. The specificity can be seen by comparing positive cells to surrounding cells that display no fluorescence. As mentioned in the introduction, HIV-1 that lacks the regulatory Rev protein produces RNA which is retained in the nucleus: this can be visualized as a bright signal in the nucleus, and a lack of RNA fluorescence signal in the cytoplasm. Overexpression of cellular proteins is also capable of shifting the distribution of the HIV-1 viral RNA. In Figure 2, the overexpression of proteins involved in endosomal vesicle trafficking (e.g., Rab7-interacting lysosomal protein (RILP)11 or N-terminally deleted RILP (RILPN)11, and proteins that interfere with dynein motor function [e.g. p50/dynamitin1,12], interfere with the normal steady-state localization of the viral genomic RNA as determined by FISH analyses. RILP expression leads to re-localization of the viral genomic RNA to the microtubule organization center (MTOC) 13; RILPN disperses late endosomes within the cytoplasm due to the inability to bind to p150Glued of the dynein motor complex 14 and p50/dynamitin blocks the large subunit of dynein motor and releases late endosomes but also the viral genomic RNA and HIV-1 structural proteins to the cell periphery1 (Figure 2). The manipulation of the steady-state localization of the viral genomic RNA, a key contributor to the infectiousness of virus particles, would be key to the eventual development of therapeutics. In our hands, viral RNA appears in the cell as early as 3 hours post-transfection and infection10 and becomes readily observable by this FISH technique by 12 hours. Figure 1. Flow chart of the protocol for FISH/IF co-analyses. Cells are grown on coverslips and then fixed with paraformaldehyde. Treatments of glycine and Triton-X are performed before the cells are either used for FISH/IF or stored in 70% ethanol for storage. Cells dehydrated for storage are rehydrated in 1X DPBS (DEPC-treated PBS) before continuing on to FISH/IF. Cells are treated with DNase I and left overnight to hybridize with probe. Once hybridization is complete, the cells are washed with formamide, as well as with SSPE, and a final 1X DPBS rinse. Blocking solution is applied to the cells, followed by incubation with the primary antibodies. After washing, secondary antibodies are applied. Two final washes in 1X DPBS complete the staining procedure where upon the coverslips are dried and mounted on slides for imaging. Figure 2. Representative results using FISH/IF co-analyses. A) HIV-1 is transfected into HeLa cells and in some cases with constructs that cause the overexpression of cellular proteins (RILP, p50/Dynamitin and RILPΔN (an amino-terminal deletion mutant)). FISH/IF co-analyses was performed: RNA is identified in green with either G3BP or LAMP1 (red) to differentiate. B) HIV-1 is expressed in HeLa and collected at different time points. Viral RNA expression is tracked in green while the cellular protein, hnRNP A1, is stained in red. Size bars are 10 μm. Images modified from references 1 (select figures from panel A; RILP, p50/Dynamitin, and RILP deltaN) and 17 (panel B). FISH/IF co-analyses is a reliable method to visualize viral RNA in cells which has now been refined 9,15,16. Over the course of several years, we have developed a refined method of staining for RNA. This technique can be used on a wide array of cell types provided the probe is specific to the target RNA17. By labeling the probe with DIG, we are capable of visualizing the RNA by simple staining. When staining for RNA and other proteins are combined, FISH/IF co-analyses become a powerful tool to observe cellular structures and protein/RNA localization. The specificity of the RNA detection is quite high. This is illustrated in Figure 2. In some of the original work that focused on viral genomic RNA localization, FISH established that a lack of Rev trapped viral RNA in the nucleus18. Since this, abundant new information on viral genomic RNA localization has been obtained using the technique outlined here. By overexpressing cellular proteins, specific populations -and not all- of the viral RNA can be forced to localize to different regions of the cell. RILP overexpression, which resembles the phenotype obtained when hnRNP A2 is depleted by siRNA in HIV-1-expressing cells13, causes the RNA to visibly accumulate at the MTOC. The viral genomic RNA can be pushed to the cell periphery by disabling the minus-end motor protein, dynein: p50/Dynamitin overexpression or knockdown of the dynein heavy chain1 results in the release of viral genomic RNA from intracellular domains to the cellular periphery (Figure 2). 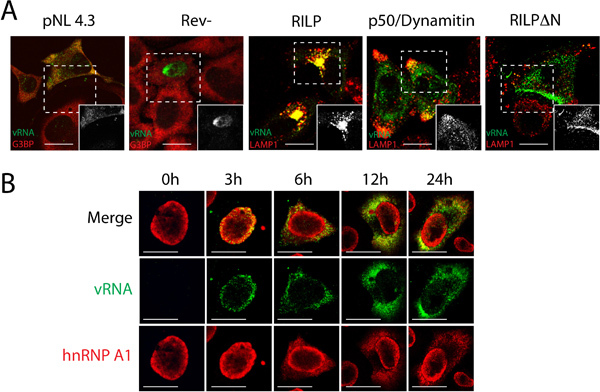 A mutant of RILP, RILPΔN, which no longer binds the dynein motor, disperses endosomes (tagged by LAMP1) into the cytoplasm because they are no longer actively localized at juxtanuclear domains. These results point to the notion of a plastic population of HIV-1 genomic RNA and in particular, that different pools of HIV-1 genomic RNA exist with sometimes identifiable roles in the viral replication cycle. These same notions have already been identified for the protein encoded by this mRNA, Gag 19. There are limitations to the uses of FISH/IF co-analyses that are related to antibody choice and availability. The optimization of the best combination of primary and secondary antibodies, and their concentrations, will take time to optimize (see Table 1 & 2). Antibodies made from hybridomas or produced by major companies can have concentrations which vary anywhere from 1:2 to 1:2000, but be sure to follow the guidelines provided by the manufacturer for best results. The host in which the antibody is produced must also be taken under consideration. Mixing sheep with goat antibodies should also be avoided in primary and secondary antibodies as this combination results in high background due to cross-species recognition (data not shown). For Alexa-Fluor secondary antibodies, the concentration can be used at 1:500 for almost any antibody in the set. The other drawback to FISH/IF co-analyses as described in this report is it captures the RNA at its location at steady-state, after cells have been fixed and permeabilized using paraformaldehyde and detergent (Figure 1). However, RNA imaging in live cells has been achieved through a variety of means 20-22, mostly using variations of viral RNA genomes that are tagged by fluorescent proteins such as GFP. However, additional means to identify RNA localization in live cells continue to surface. These new methods involve the tagging RNA by means of Spinach 23, SNAP 24, or MTRIP 2. These techniques also suffer from a few drawbacks including the requirement to permeabilize cells before adding substrates or that a moiety must be engineered to tag the mRNA in order detect the mRNA by microscopy. Indeed, the major advantage of FISH analyses outlined in this report lies in the fact that the native RNA is unaltered leading to the most physiologically relevant results. The authors thank past and present members of the lab for contributions to the development of the methodology outlined here and to Alan Cochrane for advice. L.A. is a recipient of a Canadian Institutes of Health Research (CIHR) Doctoral Fellowship and AJM is supported by a Fraser, Monat and MacPherson Career Award. This work is supported by a grant from the CIHR (grant #MOP-56974). Lehmann, M. Intracellular transport of human immunodeficiency virus type 1 genomic RNA and viral production are dependent on dynein motor function and late endosome positioning. J. Biol. Chem. 284, 14572-14585 (2009). Zurla, C., Lifland, A. W., Santangelo, P. J. Characterizing mRNA interactions with RNA granules during translation initiation inhibition. PLoS One. 6, e19727 (2011). Abrahamyan, L. G. Novel Staufen1 ribonucleoproteins prevent formation of stress granules but favour encapsidation of HIV-1 genomic RNA. J. Cell Sci. 123, 369-383 (2010). Milev, M. P., Brown, C. M., Mouland, A. J. Live cell visualization of the interactions between HIV-1 Gag and the cellular RNA-binding protein Staufen1. Retrovirology. 7, 41-41 (2010). Vercruysse, T. Measuring cooperative Rev protein-protein interactions on Rev responsive RNA by fluorescence resonance energy transfer. RNA Biol. 8, 316-324 (2011). Cullen, B. R. Nuclear mRNA export: insights from virology. Trends Biochem. Sci. 28, 419-424 (2003). Cmarko, D. Rev inhibition strongly affects intracellular distribution of human immunodeficiency virus type 1 RNAs. J Virol. 76, 10473-10484 (2002). Ajamian, L. Unexpected roles for UPF1 in HIV-1 RNA metabolism and translation. RNA. 14, 914-927 (2008). Beriault, V. A late role for the association of hnRNP A2 with the HIV-1 hnRNP A2 response elements in genomic RNA, Gag, and Vpr localization. J. Biol. Chem. 279, 44141-44153 (2004). Monette, A., Pante, N., Mouland, A. J. HIV-1 remodels the nuclear pore complex. J. Cell Biol. 193, 619-631 (2011). Jordens, I. The Rab7 effector protein RILP controls lysosomal transport by inducing the recruitment of dynein-dynactin motors. Curr. Biol. 11, 1680-1685 (2001). Schrader, M., King, S. J., Stroh, T. A., Schroer, T. A. Real time imaging reveals a peroxisomal reticulum in living cells. J. Cell Sci. 113 (Pt. 20), 3663-3671 (2000). Levesque, K. Trafficking of HIV-1 RNA is mediated by heterogeneous nuclear ribonucleoprotein A2 expression and impacts on viral assembly. Traffic. 7, 1177-1193 (2006). Rocha, N. Cholesterol sensor ORP1L contacts the ER protein VAP to control Rab7-RILP-p150 Glued and late endosome positioning. J. Cell Biol. 185, 1209-1225 (2009). Soros, V. B., Carvajal, H. V., Richard, S., Cochrane, A. W. Inhibition of human immunodeficiency virus type 1 Rev function by a dominant-negative mutant of Sam68 through sequestration of unspliced RNA at perinuclear bundles. J. Virol. 75, 8203-8215 (2001). Sanchez-Velar, N., Udofia, E. B., Yu, Z., Zapp, M. L. hRIP, a cellular cofactor for Rev function, promotes release of HIV RNAs from the perinuclear region. Genes Dev. 18, 23-34 (2004). Monette, A., Ajamian, L., Lopez-Lastra, M., Mouland, A. J. Human immunodeficiency virus type 1 (HIV-1) induces the cytoplasmic retention of heterogeneous nuclear ribonucleoprotein A1 by disrupting nuclear import: implications for HIV-1 gene expression. J. Biol. Chem. 284, 31350-31362 (2009). Malim, M. H., Hauber, J., Le, S. Y., Maizel, J. V., Cullen, B. R. The HIV-1 rev trans-activator acts through a structured target sequence to activate nuclear export of unspliced viral mRNA. Nature. 338, 254-257 (1989). Klein, K. C., Reed, J. C., Lingappa, J. R. Intracellular destinies: degradation, targeting, assembly, and endocytosis of HIV Gag. AIDS Rev. 9, 150-161 (2007). Molle, D. Endosomal trafficking of HIV-1 gag and genomic RNAs regulates viral egress. J. Biol. Chem. 284, 19727-19743 (2009). Jouvenet, N., Bieniasz, P. D., Simon, S. M. Imaging the biogenesis of individual HIV-1 virions in live cells. Nature. 454, 236-240 (2008). Kemler, I., Meehan, A., Poeschla, E. M. Live-cell coimaging of the genomic RNAs and Gag proteins of two lentiviruses. J. Virol. 84, 6352-6366 (2010). Paige, J. S., Wu, K. Y., Jaffrey, S. R. RNA mimics of green fluorescent protein. Science. 333, 642-646 (2011). Eckhardt, M. A SNAP-tagged derivative of HIV-1--a versatile tool to study virus-cell interactions. PLoS One. 6, e22007 (2011). This is a very interesting method, and your results look great! Have you attempted this method with tissue sections from animals, be in frozen or fixed or parafin embedded or anything like that? I am a students of eight year program of clinical medicine of Xiangya medical school, Central South university of China, and I have been doing a research for my M.D degree on Spinal Muscular Atrophy(SMA) . Now I have been doing research on the mechanism of the protein Survival Motor Neuron (SMN) during the fusion of myoblasts to form myotubes, and how it affects the development of skeletal muscle when SMN is reduced, as always seen in the biopsy of those SMA patients. My hypothesis is that the role of SMN is to transfer the mRNA of β-actin to the lamellepodia of fusing myoblast to produce β-actin locally, just the same as it dose in the development of neurons . And lamellepodia is the very organelle for migration and fusion. The key step is to prove the co-existence of the mRNA of β-actin, the protein of β-actin and the protein of SMN at the lamellepodia, and that when SMN is reduced, the β-actin protein is reduced at lamellepodia and more mRNA of β-actin is retained in the nucleus. That is quite new and it forced me to use some new technique----the combination of immunofluorescence and fluorescence in situ hybridization. However, the combination of IF-FISH is something new to our lab technicians. So I have found ² protocols newly published in ²01², and one is yoursA²88; http://www.jove.com/video/400²/detection-of-viral-rna-by-fluorescence-in-situ-hybridization-fishA²89;showing the whole process. I need your video very much because I have only 4 months left and it provides the best and the most direct guide to me. I have tried to subscribe it using my own account, but unfortunately I failed because WWW.JoVE Video.com only accepts the subscription from public institutions such as libraries. Then I have contacted the library of Xiangya medical school but with no reply yet. So could you kindly do me a favor to share this video with me? I will appreciate your great generosity, Thank you very much!